GRECE – Phaistos / Ayia Triada - The sites of Phaistos and Ayia Triada, located in the western part of the Mesara, the largest and most fertile plain of the island of Crete, were discovered and excavated at the beginning of the last century, and have always been considered to be complementary. Phaistos, which was the first site to be occupied in the region (in a final stage of the Neolithic period), provided the remains of two superimposed court-centred buildings constructed in MM I and LM I respectively, but did not offer good evidence for the phases that preceded their construction, namely EM I-III, or for the phases that followed their destruction, namely LM II-III. Ayia Triada, which was first occupied at the beginning of EM I, provided two buildings constructed and abandoned within the EM IIA period, a necropolis with two tholos tombs and several annexes that were mainly used as receptacles for human bones and offerings between EM II and LM III, a royal villa destroyed in LM IB, and several LM III monumental structures. This paper focuses on the Prepalatial period and, building on the results of the new stratigraphic and chronological re-assessment undertaken by Simona Todaro after the conclusion of the third cycle of excavations carried out by V. La Rosa, aims to provide new insights into the history of the two sites showing that they do indeed provide crucial and complementary information for reconstructing the social life of the Mesara communities. More specifically, after a brief introduction to the new chronological framework for the Prepalatial period, which is based on the stratigraphic sequence established at Phaistos, special attention will be paid to three issues: 1) colonization of the Phaistos hill and the ritual practices performed on the hilltop from the FN period; 2) colonization of the western part of the Mesara and the foundation of Ayia Triada at the beginning of the EM I period; 3) re-organization of the Phaistos hill at the beginning of the EM III period, in the course of a large building project that marked the beginning of the palatial phenomenon in south central Crete. 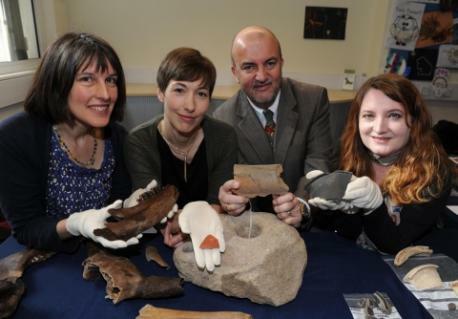 ROYAUME UNI – Edinburgh - Archaeologists made the discoveries, with dozens of other artefacts, during the excavation of a building site in Edinburgh's Old Town. Three buildings of historical significance were previously located in the area, the 18th-century Old High School, the 16th-century Royal High School and the 13th-century Blackfriars Monastery. The latter was founded in 1230 by King Alexander II of Scotland, but destroyed during the Protestant Reformation in 1558 and the exact location of the monastery was unknown before this archaeological dig. 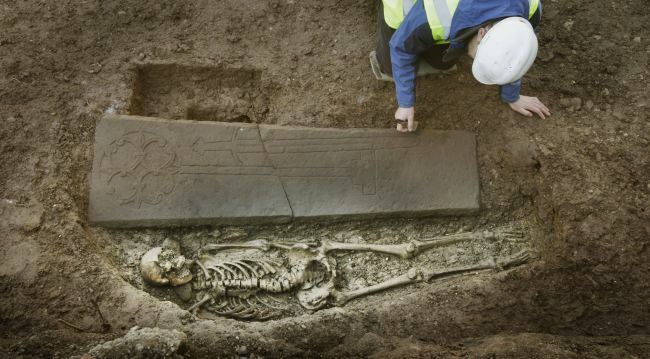 Also unearthed was a slab of sandstone, decorated with carvings of the Calvary cross and an ornate sword which signaled that it was the grave of a knight or other nobleman. The skeleton's bones and teeth are to be further analysed by experts to learn where the person was born, what he ate, where he lived and how he died. KENYA – Manda - A joint expedition of scientists led by Chapurukha M. Kusimba of The Field Museum and Sloan R. Williams of the University of Illinois at Chicago has unearthed a 600-year-old Chinese coin on the Kenyan island of Manda that shows trade existed between China and east Africa decades before European explorers set sail and changed the map of the world. The coin, a small disk of copper and silver with a square hole in the center so it could be worn on a belt, is called "Yongle Tongbao" and was issued by Emperor Yongle who reigned from 1403-1425AD during the Ming Dynasty. The emperor's name is written on the coin, making it easy to date. 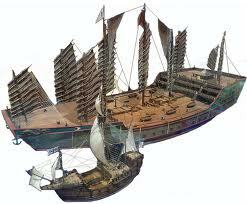 Emperor Yongle, who started construction of China's Forbidden City, was interested in political and trade missions to the lands that ring the Indian Ocean and sent Admiral Zheng He, also known as Cheng Ho, to explore those shores. "Zheng He was, in many ways, the Christopher Columbus of China," said Dr. Kusimba, curator of African Anthropology at The Field Museum. "It's wonderful to have a coin that may ultimately prove he came to Kenya," he added. Dr. Kusimba continued, "This finding is significant. We know Africa has always been connected to the rest of the world, but this coin opens a discussion about the relationship between China and Indian Ocean nations." That relationship stopped soon after Emperor Yongle's death when later Chinese rulers banned foreign expeditions, allowing European explorers to dominate the Age of Discovery and expand their countries' empires. The island of Manda, off the northern coast of Kenya, was home to an advanced civilization from about 200AD to 1430AD, when it was abandoned and never inhabited again. Trade played an important role in the development of Manda, and this coin may show trade's importance on the island dating back to much earlier than previously thought. "We hope this and future expeditions to Manda will play a crucial role in showing how market-based exchange and urban-centered political economies arise and how they can be studied through biological, linguistic, and historical methodologies," Dr. Kusimba said. 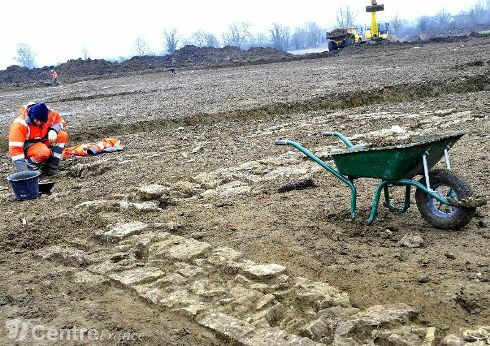 FRANCE – Magny Cours - À Magny-Cours, lors d'un diagnostic archéologique réalisé par l'INRAP (Institut national de recherches archéologiques préventives) en janvier 2012, le sol des parcelles destinées à l’extension du Technopôle a livré des vestiges gallo-romains de grand intérêt : les traces de plusieurs bâtiments formant un important sanctuaire. Des fouilles préventives s'imposaient donc. Elles sont en cours, sous la responsabilité scientifique de Gabriel Roque (service d’archéologie du conseil général de l’Allier). Trois campagnes sont prévues, étalées jusqu'au printemps 2014. Les vestiges sont très arasés, mais les archéologues ont identifié six bâtiments, dont un en forme de fer à cheval, et un autre avec bassin. Trois petit temples (fanum) ont également été repérés. Au regard d'un petit espace cerné de murets, les fouilleurs n’écartent pas la possibilité de se trouver en présence d’un petit établissement thermal. Hypothèse qui renforcerait l’idée un sanctuaire très axé sur les bienfaits de l’eau. Le diagnostic de l'INRAP avait également permis de mettre au jour des ex-voto en bois. Objets qui pourraient étayer l'hypothèse d'un sanctuaire guérisseur, avec un culte organisé autour d'une eau aux propriétés curatives. ROYAUME UNI – Hinkley C site - Excavations at the Hinkley C site have revealed the remains of a 3,000-year-old Bronze Age settlement. Archaeologists have also discovered the first Saxon grub hut to be found in Somerset, and a number of Roman features and artefacts, including a grain drier, quern stones, a stone anchor, fishing net weights, jewellery and graves. The work was funded by EDF Energy as part of its site preparations and carried out by Somerset County Council. The county’s heritage team is now carrying out an outreach programme across Somerset, giving people the chance to find out more about the history of the site. TURQUIE – Istanbul - An excavation team has announced that evidence from two settlements in İstanbul dating back 8,500 years, uncovered during construction on the Marmaray Project, may indicate that their residents were related. Zeynep Kalkan, director of the İstanbul Archaeological Museum and head of the archeological team working alongside the construction crew, stated that a recent find in İstanbul's Pendik district, located on the Asian side of the Bosporus, included gravesites that contained numerous skeletons buried in the hocker position -- a fetal-like position where the arms are embracing the lower limbs – and items such as spoons, needles, kitchen utensils and tinderboxes. After a study by the team, experts announced that the residents of the settlement in Pendik and those of a settlement in Yenikapı, on the European side of the city, in 2004 may be related. “The finds in Pendik and in Yenikapı are very similar in terms of architecture, tools and form of burial. 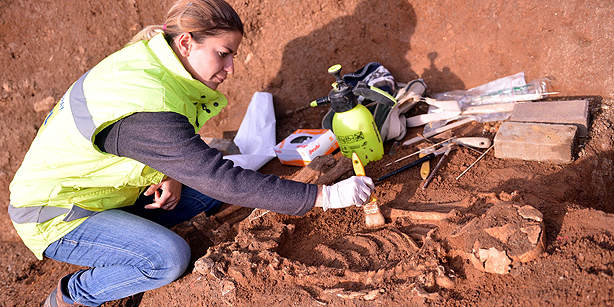 After a DNA analysis taken from skeletons from both settlements, we can be sure that they were related,” said Kalkan. The excavation work for the public transportation project is being monitored by archaeologists from the museum. Various artifacts have been found, including human skeletons, church ruins, water wells and fossilized footprints, and nearly 1 million cases of earthenware pots and plates have been uncovered thus far. One of the most outstanding historical artifacts to be unearthed is the fourth-century Port of Theodosius from the Byzantine era. Moreover, 36 sunken ships -- 30 of which were merchant vessels equipped with sails and five of which were galleys propelled by rowers -- that sank between the fifth and 11th centuries have also been located. All the pieces undergo classification and if possible, broken artifacts are restored. Some 40,000 historical items which help to illuminate the ancient history of İstanbul have been discovered during the archeological work, carried out by 500 laborers and 60 experts.